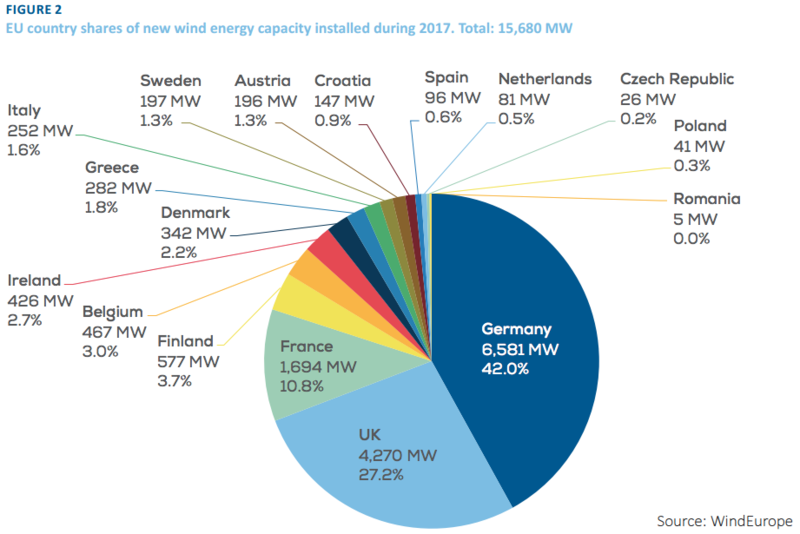 EUROPE: Wind installations in the Europe Union (EU) grew 20% in 2017, with 15.68GW installed across the region, but trade bodies are warning of an approaching cliff edge. The EU now has 169.3GW of wind power capacity installed, according to the latest annual figures by trade body WindEurope. Onshore installed capacity increased by 12.53GW in 2017, meaning 153.5GW of total capacity, as of the end of the year. Offshore installation rates doubled from 2016, adding 3.15GW and leading to a cumulative 15.8GW of capacity. 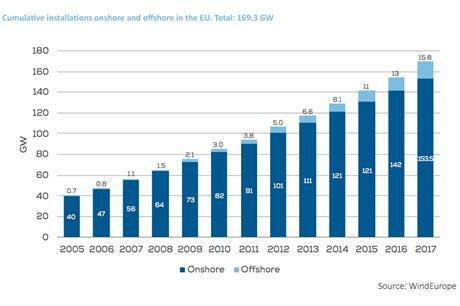 Seven European countries had record years for wind growth, as Germany (6.6GW) and the UK (4.3GW) benefited from offshore wind's surge. Meanwhile, France (1.7GW), Finland (577MW), Belgium (476MW), Ireland (426MW) and Croatia (147MW) also all had new record high levels of deployment. Wind power remained the second largest generating source of electricity in Europe, WindEurope said, accounting for 18% of the total capacity. 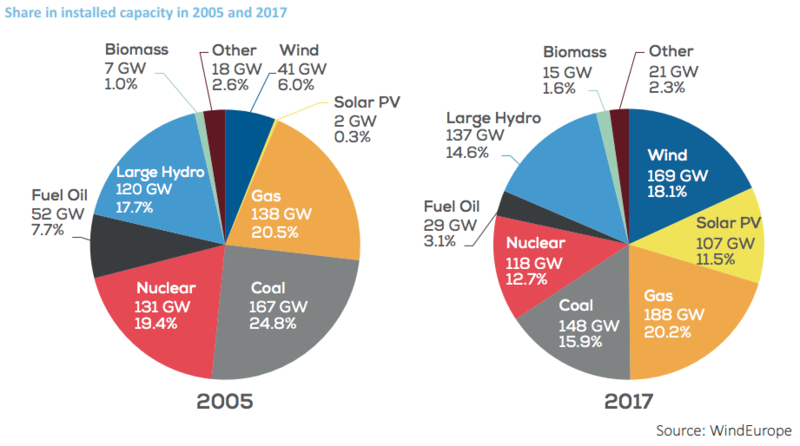 In 2016, wind overtook coal as the second largest capacity in Europe, and with gas-fired plants being decommissioned at almost the same rate as installation, wind is catching up. However, WindEurope and the World Wind Energy Association (WWEA) warned the growth in 2017 was the result of projects being "pushed through the gates" to benefit from feed-in tariffs, ahead of the widespread shift to auction-based systems, and could leave to a large drop-off in the medium term. "The transition to auctions has been messier than we hoped. And crucially we lack clarity from many governments on their ambitions for renewables post-2020. Countries need to start clarifying how much wind energy they want to deploy in the future," said WindEurope chief executive Giles Dickson. "2017 was a strong year for wind energy with a high number of new installations and wind accounting for 12% of Europe's electricity. It's further evidence that wind is mainstream and delivers bang for your buck. "It's cheap, increasingly stable, and industrial consumers are now turning to it as an energy source of choice. Governments have nothing to fear from being ambitious on wind energy and renewables more broadly," he added. In its report looking at global wind installation figures — which found over 52.5GW of new wind capacity added worldwide last year — Stefan Gsänger, secretary general of the WWEA, echoed WindEurope's European warning. "Obviously, many governments have understood that wind power brings great benefits to their societies, as it is emission-free, cheap, domestic and accessible and offers a very attractive pathway to achieving the Paris agreement. "However, signs of weakness — in particular in Europe — are a matter of concern. The European Union and its member states should urgently reinforce their efforts to deploy wind power as part of an overall renewable energy strategy and to work out a roadmap for a 100% renewable energy future." WWEA said the record installation figures in some European states was "the result of an anticipated market collapse, due to the switch from feed-in tariffs to auctions, which has been imposed by the European Commission and creates major difficulties in particular for small and medium-sized investors, including community ownership". Installation activity took place in 17 countries last year, down from 20 countries adding capacity in 2016, WindEurope said. Approximately 80% of new capacity took place in just three countries. Wind contributed 55.4% of new generating capacity last year, followed by an additional 6.1GW of solar PV added, roughly 21.5% of all new generating capacity in Europe. In 2017, wind contributed 11.6% of electricity demand in the 28 EU member states, with ten countries exceeding 10% of their own demand. Malta is the only EU-member state that is yet to install any wind power capacity, according to WindEurope. In 2017, onshore wind turbine sizes varied greatly. The average capacity installed last year was 2.7MW. However, machines in Denmark and Finland averaged 3.4MW, while the five turbines installed in Romania last year were each 1MW.